Using a damp paper towel, wipe mushrooms of any dirt. Thinly slice and set aside. Trim stem end of green beans if needed. On a foil-lined baking sheet, toss green beans, sliced mushrooms, and pancetta with olive oil and a little black pepper. Place in the preheated oven, and set a timer for 10 minutes. When the 10-minute timer is up, begin the fish. Season both sides of tilapia with salt & pepper. Heat a small amount of oil in a nonstick skillet over medium heat. When oil is hot, add fish and cook 3-5 minutes or until golden brown. Gently turn fish with a spatula, sprinkle with sliced scallion and drizzle spicy korean sauce over the top of the fish. Cover with a lid and cook another 3-5 minutes depending on thickness. Test fish for doneness, then remove from heat. While fish cooks, transfer brown rice to a microwave-safe bowl and heat in 30-second intervals until hot. Check the green beans, and remove from the oven when the beans are tender and the mushrooms are golden brown. 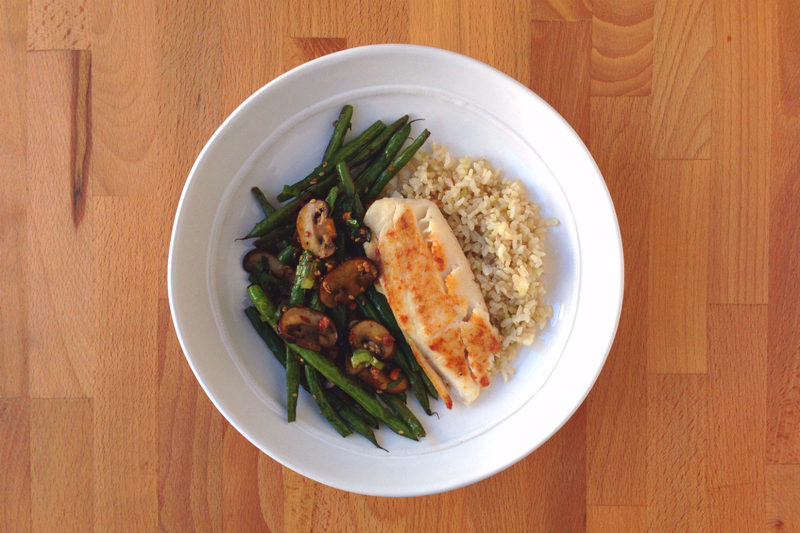 When everything is ready, divide korean-style green beans and brown rice between plates. Top with spicy tilapia, and enjoy! This entry was posted in Meal-Kit Recipes, Seafood on January 10, 2016 by Megan Rappe.